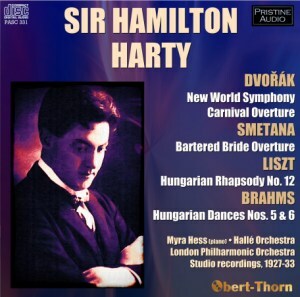 The centrepiece of this disc is Hamilton Harty’s 1927 recording of Dvořák’s New World Symphony. It has been issued before, on Symposium 1169 and on Hallé Tradition CD HLT8000, but this Pristine Audio comfortably surpasses them both. The lifelike but noisy Symposium had a number of annoying ticks, and the Hallé Tradition was a dead duck, being badly over-processed. Pitching has also been corrected in this latest transfer. Though repeats were light on the ground in this Columbia recording, the basic elements of Harty’s performance are intact. Its linearity is coupled with intensity to produce a performance of volatile drive. There are even times when one thinks of Harty’s English contemporary Albert Coates. Harty certainly drives to the crest of the climax in the first movement with powerful zest. One appreciates too the Mancunian winds, as individualistic as ever, and the famed, taut brass. The strings play with considerable dash led, I think, by Alfred Barker - this recording was made just after Harty and his leader Arthur Catterall fell out with spectacular results. It’s a recording in which Allegro molto means just that and in which con fuoco means con fuoco. Idiosyncrasies noted, there is a huge amount to admire, not least in the poetic sensibility brought to bear on the music which, combined with its masculine fervour, alerts one to the all round stature of the direction and music making. Harty made very few bad records. Harty, at the turn of the twentieth century, one of London’s most admired piano accompanists, was joined by Myra Hess for a clubbable and ebullient Slavonic Dance in C major, the first of the Op.46 set. At a time when most of Harty’s acoustic piano recordings lie languishing in limbo, it’s good to find this 1933 electric restored to the marketplace. I remember it fondly from a Pearl LP transfer. The Carnival Overture (with the London Philharmonic this time) was recorded a few days before the Symphony in a mini Dvořák­fest. This makes it the earliest of the pieces in this disc. Once more we feel Harty’s liking for lithe and directional intensity - purposeful, dynamic, and alive with kinetic energy. His accelerandi are truly inspiring. To complete the Czech theme we have the overture to The Bartered Bride from 1933, another brisk, zesty traversal. Don’t overlook the famous Doppler arrangement of Liszt’s Hungarian Rhapsody No.12 in which the Halle principals can be heard in their vivid splendour, as can some truly luscious portamenti from the Hallé strings. Nor the two Brahms arrangements where the sound in the Free Trade Hall is more recessive than Central Hall, Westminster two years later. The boxier sound for the Brahms duo is not fatal. This well selected programme with its Czech and Hungarian theme has been finely transferred.